The following cases were heard under the Aroostook Criminal Docket at the Houlton Courthouse during the month of June. 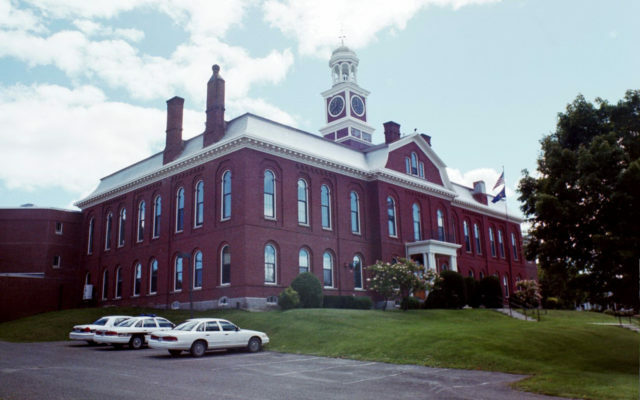 HOULTON, Maine — The following cases were heard under the Aroostook Criminal Docket at the Houlton Courthouse during the month of June. Colen M. McNally, 52, Sherman: unlawful trafficking in scheduled drugs, six months in jail, probation partially revoked. Jamie Day, operating while license suspended or revoked, prior, $1,000 fine, 50 hours of community service. Willis J. Nason, 49, Hodgdon: possessing sexually explicit material of minor under 12, 30 months in prison all but three months suspended, six years probation. Alan B. Bouchard, 48, Bangor: unlawful possession of scheduled drug, $400 fine. Lorrie A. Losinger, 47, Linneus: domestic violence assault, priors, dismissed; refusing to submit to arrest or detention, physical force, three days in jail; domestic violence assault, three days in jail. Jason Jordan, 36, Presque Isle: aggravated assault, dismissed. Paul J. Stockley, 30, Linneus: criminal trespass, 10 days in jail; criminal mischief, 10 days in jail. Randy L. Smith, 60, Patten: unlawfully furnishing scheduled drug, $400 fine, four years in prison all but 12 months suspended, two years probation, $120 restitution; unlawful possession of heroin, dismissed. Brittany Long, 29, Windham: theft by unauthorized taking or transfer, priors, 358 days in prison, probation revoked. Paul Joseph Stockley, 30, Hodgdon: violating condition of release, 10 days in jail. John Rodney Drew, 35, Island Falls: unlawful possession of scheduled drug, 120 days in jail, probation revoked. Nicole Hall, 30, Houlton: criminal trespass (three counts) 90 days in jail (each); theft by unauthorized taking or transfer (two counts), 90 days in jail (each); operating after habitual offender revocation, priors, $1,000 fine, nine months and one day in prison. Craig D. Kneeland, 28, Verona: unlawful possession of scheduled drug, $400 fine, 14 days in jail; violating condition of release, 14 days in jail; operating while license suspended or revoked, dismissed. Nicole Hall, 30, Houlton: violating condition of release, 30 days in jail; refusing to submit to arrest or detention, physical force, dismissed. Josiah D. Nash, 31, Monticello: operating while license suspended or revoked-OUI, $750 fine, seven days in jail, license suspended 12 months. Matthew Lowe, 34, Ludlow: operating snowmobile under the influence over 21, $400 fine. Mark Robert Brown, 43, Houlton: domestic violence assault, $500 fine. Austin McAfee, 19, Bangor: violating condition of release, 30 days in jail. Nicolette Tompkins, 20, Bridgewater: theft by unauthorized taking or transfer, 48 hours in jail; operating while license suspended or revoked, $250 fine. Darryl J. Hawkes, 44, Westbrook: unlawful possession of scheduled drug, $400 fine, $240 restitution; criminal forfeiture of property. James S. Flynn, 44, Raymond: unlawful possession of cocaine, dismissed; unlawful possession of scheduled drug, $400 fine, criminal forfeiture of property. Nicholas B. Boulier, 31, Nackawic, New Brunswick: eluding an officer, 114 days in jail; motor vehicle speeding: 30-plus mph over speed limit, dismissed; driving to endanger, dismissed. Sonia Smith, 49, theft by unauthorized taking or transfer, dismissed. Dustin R. McDermott, 31, New Limerick: aggravated assault, dismissed. Nichoel Watson, 35, Ludlow: unsworn falsification, 24 hours in jail, 20 hours community service; permitting unlawful use, $200 fine. Melanie Pinette, 31, Marshfield: theft by unauthorized taking or transfer, $200 fine; violating condition of release, $200 fine. Matthew L. Thibodeau, 31, New Limerick: operating while license suspended or revoked, prior, $500 fine, seven days in jail; attaching false plates, 48 hours in jail. Megan Fitzpatrick, 24, Houlton: OUI (alcohol)-no test, $600 fine, 96 hours in jail, license suspended 150 days. Frederick Fitzpatrick, 29, Hammond Twp. : OUI (alcohol) $500 fine, 48 hours in jail, license suspended 150 days. Nicolette Tompkins, 20, Bridgewater: violating condition of release,48 hours in jail; failure to register vehicle, 48 hours in jail; operating while license suspended or revoked, $250 fine, 48 hours in jail. Ezra J. Brady, 27, Bridgewater: operating while license suspended or revoked, prior, dismissed; operating while license suspended or revoked, prior, $500 fine, 48 hours in jail; failing to make oral or written accident report, 48 hours in jail. Matthew L. Thibodeau, 31, New Limerick: operating while license suspended or revoked, prior, dismissed. Jonathan Tuttle, 23, New Limerick: OUI (alcohol), $500 fine, 48 hours in jail, license suspended 150 days. Brittany Long, 29, Windham: theft by unauthorized taking or transfer, priors,18 months in prison. James B. Nickerson, 38, Smyrna: domestic violence terrorizing, 364 days in jail all but seven days suspended, one year probation; theft by unauthorized use of property, dismissed; criminal trespass, dismissed; operating a vehicle without license, 48 hours in jail. Douglas V. Reed, 42, Hermon: criminal trespass, dismissed. William Patenaude, 47, Goffstown, N.H.: criminal trespass, dismissed. David Mendes, 63, Pelham, N.H.: criminal trespass, dismissed. Roland Foss, 72, Orono: criminal trespass, dismissed. Nicholas B. Desmarais, 37, Blackstone, Mass. : criminal trespass, dismissed. Storm J. Cowan, 53, Windham, N.H.: criminal trespass, dismissed. Derek Comeau, 48, Edgewater, Md: criminal trespass, dismissed. Nelson Chapman, 52, Caribou: criminal trespass, dismissed. Joel M. Pisarek ll, 31, Houlton: operating while license suspended or revoked, filed on $100 costs. Jonathan Tuttle, 23, Littleton: operating vehicle without license, dismissed; failure to register vehicle, dismissed. Brittany Long, 29, Windham: trafficking in prison contraband, 18 months in prison; unlawful possession of scheduled drug, dismissed; theft by unauthorized use of property, priors, $1,000 fine, 18 months in prison; theft by unauthorized use of property, priors, 12 months in prison; violating condition of release, 30 days in jail. Horace Ed Chambers, 58, Linneus: unlawful possession of wild animal or bird, $500 fine; failing to timely register bear, deer, moose or turkey, dismissed. Brittany Long, 29, Glenburn: assault, dismissed; violating condition of release, dismissed. Dustin R. McDermott, 31, Houlton: violating condition of release, dismissed. Walker C. Webb, 19, Houlton: allowing minor to possess or consume liquor, dismissed. Dillon D. Carmichael, 20, Houlton: violating condition of release, 48 hours in jail. Justin T. McClure, 29, Calais: theft by unauthorized taking or transfer, $300 fine. Kenneth McCrary, 28, New Limerick: operating while license suspended or revoked, prior, filed on $100 costs. Joshua E. Lake, 29, Patten: operating while license suspended or revoked, prior, filed on $250 costs. Nicole Hall, 30, Houlton: violating condition of release, 90 days in jail; refusing to submit to arrest or detention, physical force, 90 days in jail; assault, dismissed; criminal attempt, 90 days in jail. Kenneth V. Carmichael, 47, Fort Fairfield: terrorizing, 30 days in jail. Cody Trahan, 21, Houlton: operating while license suspended or revoked, $250 fine. Anthony F. Nadeau, 34, Steuben: operating while license suspended or revoked, $250 fine. Jaron A. Austin, 41, Houlton: theft by unauthorized taking or transfer, $200 fine. Kevin J. Stewart, 59, Littleton: failure to register vehicle, $100 fine. Dalton Hart, 19, Benedicta: failing to stop all terrain vehicle, 48 hours in jail. Nicole Hall, 30, Houlton: arson, dismissed; trafficking in prison contraband, four months in jail; violating condition of release, 90 days in jail. Ashley A. Whitney, 35, Houlton: failing to register vehicle within 30 days, $100 fine. Henry B. Pratt, 18, Houlton: motor vehicle speeding: 30-plus mph over speed limit, $400 fine. Corey A. Porter, 42, Brookton: rule violation, possession or use of drugs on duty, $250 fine. James F. Gerrish-Baker, 21, Van Buren: attaching false plates, $150 fine. Melissa Steinberg, 20, Littleton: protective order from harassment violation, 48 hours in jail. Sherri L. Totten, 54, Presque Isle: unlawful possession of scheduled drug, $400 fine. Nathen P. Cyr, 24, Hersey: operating after registration suspended, $150 fine. Vincente G. Burgos, 56, Cary Plantation: attaching false plates, $150 fine. Karsten Pedersen, 37, Houlton: violating condition of release, 48 hours in jail. Ryan L. Bennett, 40, Houlton: violating condition of release, seven days in jail; refusing to submit to arrest or detention, refuse to stop, seven days in jail; criminal mischief, seven days in jail, $240 restitution. Shelby Suitter, 22, Houlton: criminal trespass, 48 hours in jail. Melissa M. Beal, 34, Houlton: keeping dangerous dog, $50 fine. James T. Bledsoe, 73, Houlton: allowing dog to be at large, $50 fine. Dalton Hartt, 19, Benedicta: operating ATV on public way, $300 fine; operating unregistered ATV, $200 fine. Candice R. Lawlor, 28, Houlton: keeping dangerous dog, $250 fine; keeping unlicensed dog, $50 fine. Roland Foss, 72, Orono: operating snowmobile on plowed road, $300 fine. Douglas V. Reed, 42, Hermon: operating snowmobile on plowed road, $300 fine. Nelson Chapman, 52, Caribou: operating snowmobile on plowed road, $300 fine. Storm J. Cowan, 53, Windham, N.H.: operating snowmobile on plowed road, $300 fine. William Patenaude, 47, Goffstown, N.H.: operating snowmobile on plowed road, $300 fine. David Mendes, 63, Pelham, N.H.: operating snowmobile on plowed road, $300 fine. Nicholas B. Desmarais, 37, Blackstone, Mass. : operating snowmobile on plowed road, $300 fine. Derek Comeau, 48, Edgewater, Md. : operating snowmobile on plowed road, $300 fine. Walker C. Webb, 19, Littleton: minor consuming liquor, $200 fine.